Coming off a recent visit to Myst, I was mildly satisfied with my meal. Although it wasn't a priority to revisit the place immediately, I was curious about several items they had including their shaved ice. So when Viv queried where we should go for dinner, I suggested we give it a go. Upon arriving, our plan was kiboshed due to the excessively long lineup out the door. I guess social media promotion really works as it received heavy play in the past month. 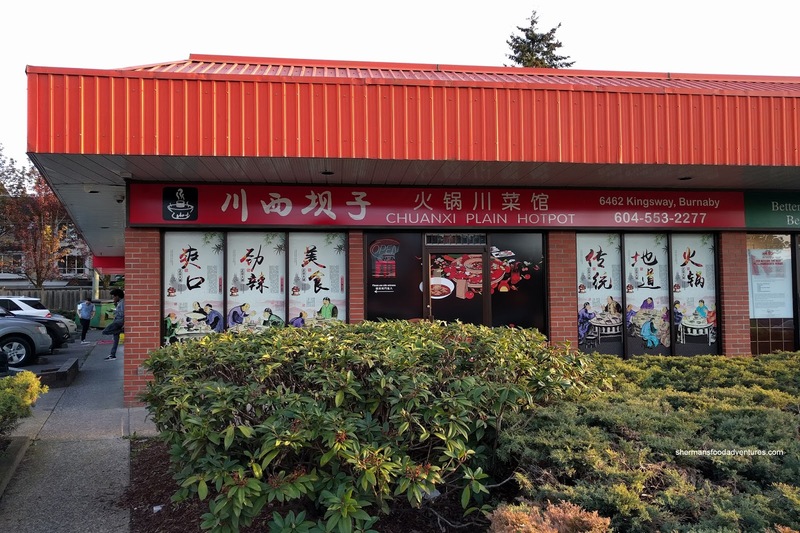 Well we weren't going to stand in line, so we ended up walking up the street to Chuanxi Plain Hot pot, where Posh used to be located. We decided to go for half and half broth consisting of Butter Spicy Soup and Nutritious Soup. 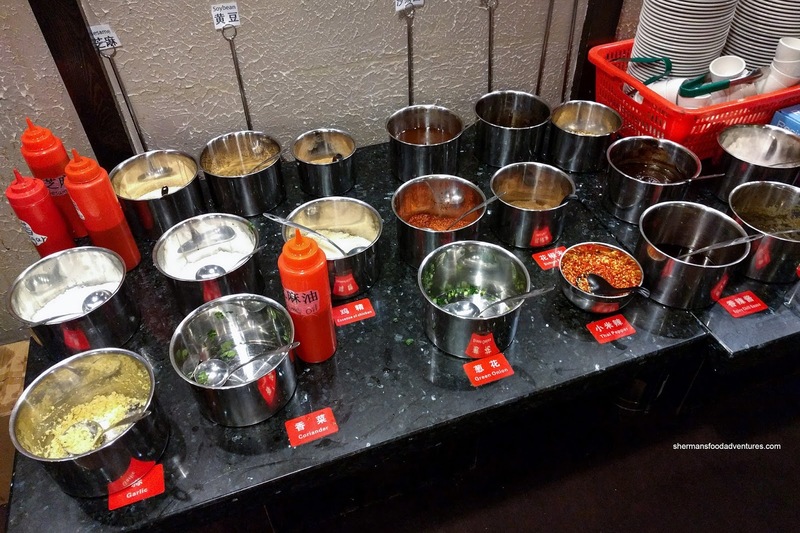 We asked for medium spicy and even at that, the broth was pretty potent. I wouldn't say it hurt to eat it nor did it burn my mouth, it was just impactful. I thought the spice level increased as we ate our meal. 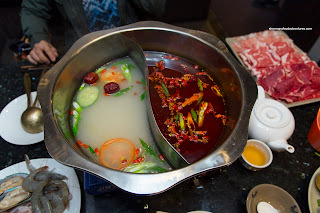 As for the nutritious broth, it was very mild and only had a mild sweetness and umaminess. Over at their sauce bar, all of the regular items were there including soy, sesame oil, vinegar, chili oil, garlic, sesame seeds, oyster sauce, satay sauce and chilis as well as some interesting ones such as msg, chicken bouillon and ground Szechaun peppercorns. Off to the side, there was some pickles too. Presented on a large platter, there was a generous portion of freshly sliced meats including Supreme Beef, Sliced Short Rib, Lamb and Pork Belly. By visuals alone, the meat looked to be appealing and of good quality. 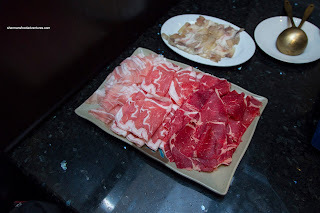 In reality, it was very good with tender thin slices of pork belly that had a good ratio of meat-to-fat. I found the lamb equally good where it was only slightly less buttery than the pork belly. Both types of beef were soft and tender with a nice meaty texture. The side of Tendon looked good being formed into a mold and sliced, but when boiled, it broke apart pretty easily as it was far too soft. We would've liked to see it more firm in texture. On another plate, we found a mound of stuff that included Honeycomb Tripe, Bible Tripe, Pork Intestine, Squid Meatballs and Sliced Basa. Of course we had to get some Veggies too (right?). 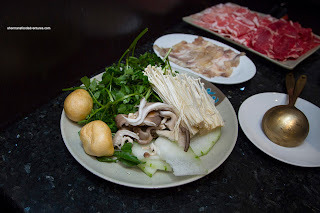 We chose watercress, enoki mushroom, oyster mushroom, wintermelon and some tofu puffs. There wasn't anything amiss with these and in fact, the watercress was pretty fresh. Liked how everything was cleaned properly too. When we were done, it was clear why Viv and I do not go for hot pot very often since we were stuffed. Best to get a few more friends next time. 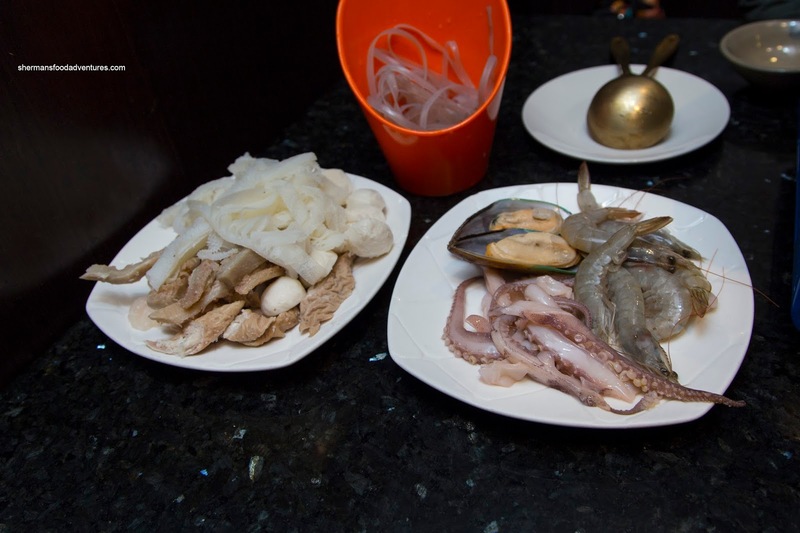 I wouldn't hesitate to return to Chaunxi as it was pretty good in my books.